The United Nations Convention on the Rights of Persons with Disabilities (CRPD) recognized that people with disabilities should have the right to exercise their legal capacity and identified supported decision-making as a means by which people with disabilities can be directly involved in decisions that impact their lives. Offering an overview of its emergence in the disability field and highlighting emerging research, theory, and practice from legal, psychology, education, and health fields, this volume provides a much-needed theoretical and evidence base for supported decision-making. Evidence and strengths-based frameworks for understanding disability, supports, and their roles in promoting supported decision-making are synthesized. 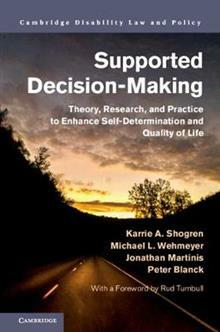 The authors describe the application of a social-ecological approach to supported decision-making, and focus on implications for building systems of supports based on current environmental demands. This volume introduces and explains empirical research on critical elements of supported decision-making and the applications of supported decision-making that enhance outcomes, including self-determination and quality of life. Karrie A. Shogren is a Professor in the Department of Special Education and Director of the Kansas University Center on Developmental Disabilities at the University of Kansas. Michael L. Wehmeyer is the Ross and Marianna Beach Distinguished Professor in Special Education and Chair of the Department of Special Education at the University of Kansas. Jonathan Martinis is Director for Law and Policy in the Burton Blatt Institute at Syracuse University, New York. Peter Blanck is University Professor and Chairman of the Burton Blatt Institute at Syracuse University, New York.